I fully agree with you, and this is already possible in v6. We are hoping to have the same but better in v7 but it will take some time. Being able to move the steps without being attached to the tread line would be a nice addition . It can become handy when you cover a concrete stair . You can then move your step at the stepcorners instead of moving around the tread line. This allow to make adjustments on any situation. New versions of StairDesigner 7 are expected for the beginning of September, however, these although these will have some features added it certainly will not have all the features you have requested. We are unlikely to have a completed functional version before the end of the year and adding specific functions like curved risers, string capping, etc will probably be added in 2017. We will certainly keep you updated. When can I expect the new version of stairdesigner 7 to be launched ? I am maybe interested but I need to know if the issues I presented and eventual additions would be in it or not is this is a deciding factor for me. I mentioned several issues and add-ons. The best you can do with StairDesigner 7 is to place the strings outside the stairwell and change the top of the stairwell to the required step shape. This will aline the last step nosing with the inside of the first flight string. You’ll have to reduce the stair width by subtracting the string thickness add the tapered shape to the landing step outside StairDesigner . But the cutting lists and drawings will enable to build stair correctly. Here is a example of exact the same stair fitting in the stairopening . This is how it should be . In the case of stairdesigner it is reducing the widh of the first flight which leaves it to narow if you want to fill up the space from wall to wall. I guess there is some work to do on the landing step. In thzt drawing you see that the landing step is not straight and the back of the step is referenced to the stair hole width. The landing step nosing can not be placed into the width of the first flight. 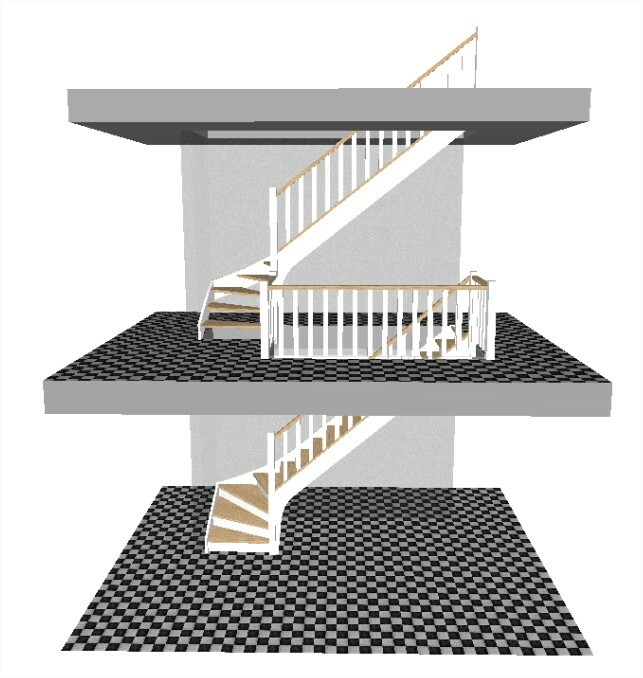 In the case of your stair, to have the landing step’s back against the joist at 885, you’d have to reduce the width of the first flight by the width of the landing step. For the moment steps can’t be shaped, this will be coming in later updates. For the moment we will be posting a new version with landings in the next few days. I a trying to draw a stair with in a space of 885mm wide and 2000 long. It turns out to the left . The problem I have with the stair is that the nose of the landingstep is used as reference for the turn to be located at the extremity of the 885 mm . The point I want to make is that the stair is becoming wider then the 885mm required and I found no way to have this fixed. It should be the back of the step being the reference . That way the stair would fit into the 885 mm wide opening which is now not the case. Also the landing step cannot be changed in shape . It seems to be mandatory that the step is straight. This is limiting the outcom of the stair. I’ve never had any shrinkage problems especially when there are risers as the distance from step to riser is very small. But your method certainly seems to have some advantages. I give it a try next time I build a stair. the reason I use the recess is to allow the wood to expand and contract without having a gap being visible between the stepnose and the stringer . Also if a stepnose gets damaged during the assembly you can easely scrape a little of the nose without having the issue of the step being too short . About the deformation of the stringer when assembled I do the following. My step has a depth of 10mm . The stringer will be machined at 11 mm depth . This ensures that the step is allways tight against the stringer . To deform more then 1mm on a surface of 35 mm the deformation needs to be big already. I have not encounterd a problem yet using this method . I found it quality improving when it comes to the finished detail. OK I see the problem with this detail. 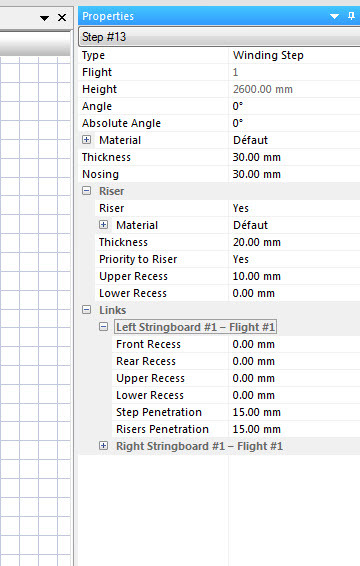 I also forgot to answer your angled flights question, when you add flights you can set the angle between them. Not sure this answers your question though. If not please feel free to tell me. In all cases a big thanks for your comments and help. 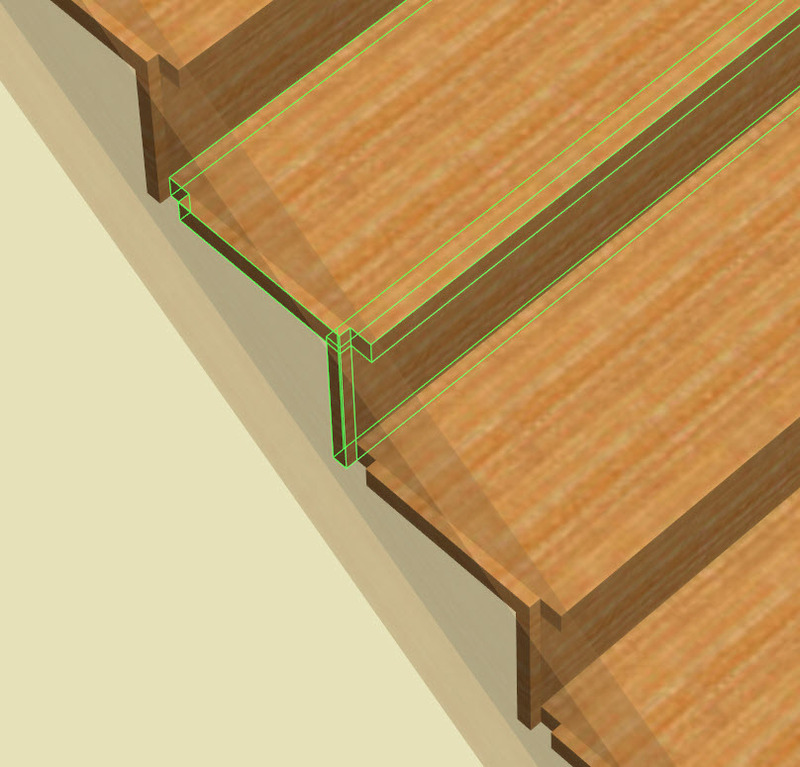 I personally have never used the step recess function but prefer to fit a rounded nosing to the rounded housing. Even when the nosing is molded I like to scribe the housing to match the step nosing. I find this enable me to have a little play between the step and stringer while maintaining a perfect fit. Especially useful if the stair has a slight deformation and winders are not exactly in place when the stair is fitted. yes I know that menu with the recess but did you check the dawing I added . ? Recess is not working when a step is worked in a newel post . If you enter a front recess on that step it wil not be done on the side of the newel post because the step is integrated in a newel post . Also the step shape is creating a wrong corner in the back of the step due to a wrong reference in the program. The step should not exit the post and afterwards entering the stringer . This creates a unwanted corner in the step. Sorry to get back so late, but we have been very busy lately. It’s Sunday and I’m taking a bit of time to answer quickly forum queries before the weeks rush starts again. For the headroom this function is in the pipe line but hasn’t been added yet. Shape of stringers is not yet planned and although I think it would be a nice function to add, it’s not top on our priority list. Changing stringer shapes is actually very easy to do either using the DXF files or directly on the paper templates or just by cutting when making the stair. Idealy of course, we should have a mini CAD program to edit string shapes in StairDesigner I never found this a real problem in using the software for manufacturing. the string is then cut into 2 and the front section can be deleted. Did you have time to check all this ? There are some important things in it . A few other things are . I cannot find the stair angle in the stair parameters as also the free space needed between stair and cieling. There should be some safety when drawing stairs that a person would not nock his head on the cieling when going up the stairs. This means that the stair hole should be entered before starting a stairdrawing. Being able to define the stringer end when needed . Most of the stringer ends are a flat above the last step with an offset of 20mm. Depending on situations you can have different ways to shape the stringer end. If you want I can send you some examples. You should also think of a radius compensation on the recess of stepnoses . When you per example recess 20 mm and the steps are machined with a 18mm mill then the radius is 9mm on the stepcorner . This needs to be taken in account on the recess in the stringer so that the step can be mounted without having to square the stepcorners . This means that the recess in the stringer must be 9 mm less then the steprecess to make it fit. This should not be a big issue to program. There you see that it is a 2 stairs project . You can see the envelopes on the stringers for the handrail . handrails a straight even as the top part of the stringer . Bottom side is free shaped . So the banisters and straight on bottom and top not only on the handrail. positioning seems not to be able by entering a value. It is only lateral and restricted in 3 options for the longitudinal direction. in front of the stepnose , behind the stepnose or centered. It would be more flexible to enter a number . As per example you choose to set the string to overpass the first step with 20 mm you are not able to choose the same for the other string as you are limited to a centered position which affects the outline of the stair and small corrections according to certain situations are limited. It should work exactly like the lateral positioning. Also like I said earlier the recess in the step is only working in the stringer . You see below drawing on the left side there is a recess of 10mm . The same recess was given on the side of the post and it does not show when entered . 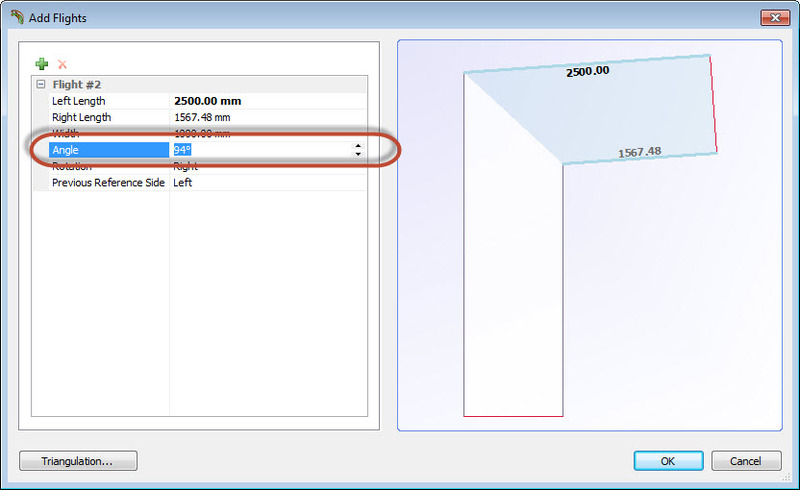 Thanks a lot for the feed back on StairDesigner 7, very helpful. – a stringer can be straight or curved but there is no possibility to have only the top section straigth and the bottom free shaping. You can only choose for the complete stringer shape. I use this to make a straight handrail. The ability to set only one edge of a string straight would be a nice feature that we will certainly be considering adding. But I’m not sure what you mean by using “this to make a straight handrail”, did you know that the strings and handrails are indépendant and you can have a curved string and straight rail or vis versa? I did not found the possibility to add a envelope on the top of the stringer (used to manufacture handrail and banister constructions). Nose reduction seems to work only on the stringer and not on the posts wich should be possible. Not sure what you mean by this remark. In this example the 1st and 3rd riser have been set back 100mm, the 1st was in the post. When shaping the first step into a special model the riser is not following the new step shape. conections between 2 stringers cannot be choosed like a pocket hole to interconnect 2 stringers ( same depth as a step in a stringer). Z step I mean a Z-shaped stair where there is a angle between the step and the riser that can be preseted. Step corrections in the flights ? Are they possible individualy ? Can they be turned around the stepline and or just move 1 side of the step and keep the other side fixed to do small corrections ? Just as in v6 steps can be rotated around the tread line, moving one end will move also swing the other as the going along the tread line is considered always constant. We will be adding a landing feature that creates steps or landings that, as in v6, break the tread line and allow you to create a step of variable width and shape. As in v6, these steps can be rotated around one of the end points (instead of the tread line) so making the tread line variable. In v7 you can make as many flights moving up as you want. What is actually missing is the landing function that enable you to break flights up into different “stairs”. This function is nearly finished and will enable you to build a stair add a landing and then add another stair etc.. 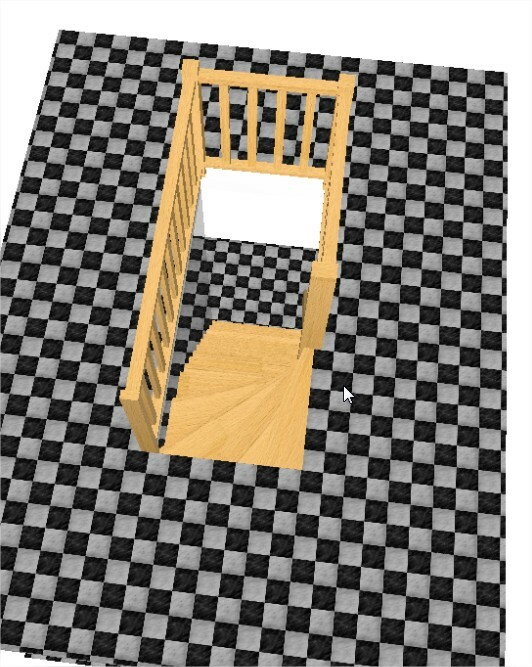 I can send you a few 3D models of stairs I made. I would like to see if the same can be build in stairdesigner. Love to see the stairs you build. To conclude, StairDesigner 7 is still a Beta version and we will be adding features probably up to the end of the year. As the development program is still open, any suggestions or criticisms that can help us get a bit of software that fits your needs and makes life easier and more fun are welcome. We can’t promise to add all the functions requested as our time and resources are limited and we’ll have to close the version at some point , but while we are still on an open version, we will certainly consider all suggestions. So please keep them coming. I downloaded the demo version and worked with it to see how it reacts. a stringer can be straight or curved but there is no possibility to have only the top section straigth and the bottom free shaping. You can only choose for the complete stringer shape. I use this to make a straight handrail. nose shape of steps different ways to place a riser project with more then 1 stair ( example 2 separated stairs on top of each other connected trough a landing ) : risers can be added and subtracted globally or form individual steps as needed. z-steps ? ( if possible ) , if you mean alternate steps, this will be a step shaping function. Otherwise can you explain? is there any possibility to free shape a stair according to the stair hole ? 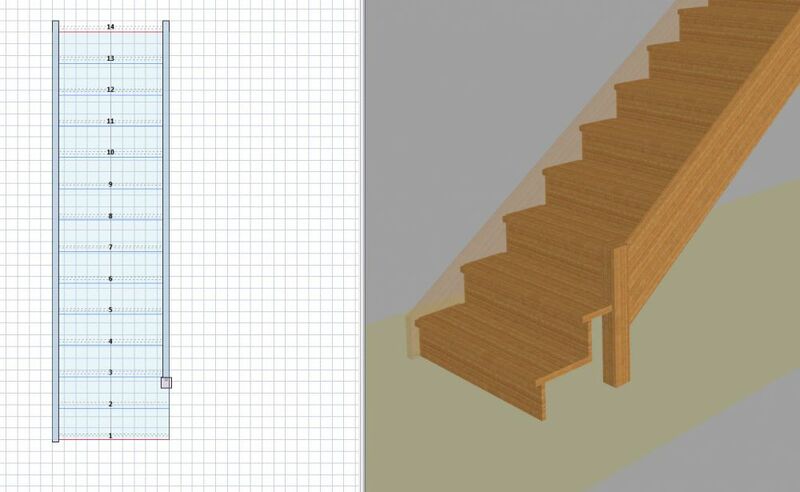 Example a stair shape drawing ( dxf ) to import in stairdesginer and use this as a base to build the stair? 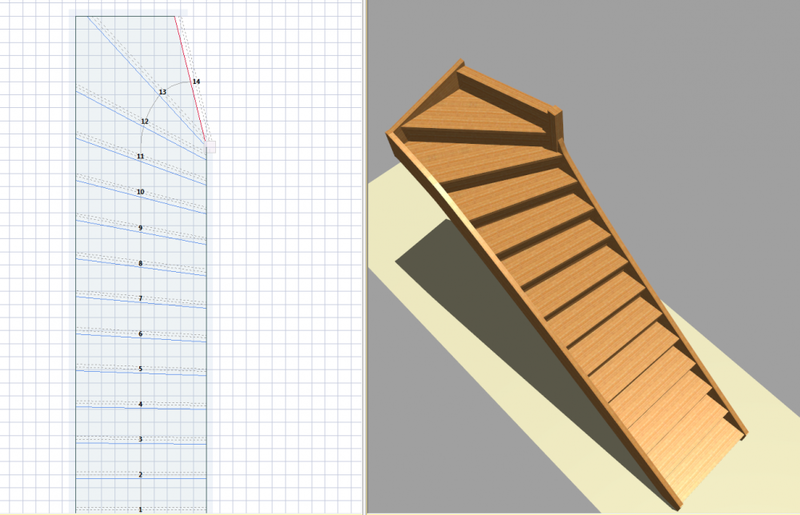 : it’s actually possible to create any shape stair, but the shape has to be drawn using the StairDesigner 7 shape editor. Importing DXF is in the box. We are adding features as they get developped and are tested and stable. We are hoping to have a fully featured StairDesigner 7 for the end of 2016. Up til then we will be offering StairDesigner 7, including all future updates free when you buy v6.